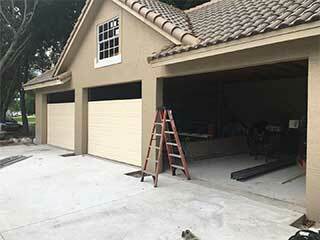 Your garage door forms part of the exterior appearance of your home, so keeping it clean will improve the look of your house and prolong the life of the door and its opener. Cleaning its parts will also keep it operating smoothly. Any type of door will eventually get dusty and dirty, and this can of course be influenced by the weather, humidity, and daily usage. A pressure washer may seem ideal but it isn’t, because the pressure may actually damage some kinds of pre-finished steel or softer wood doors. Instead, mix water and detergent, and wash by hand using a microfiber cloth. It’s fine to pre-rinse with a hose set to gentle pressure to get the door wet, then wash it, and rinse again. Wash the inside of the door too. While you’re performing a door cleaning, it’s worth doing a general cleaning of all the parts inside the garage. The door tracks collect leaves, dirt and debris, so be sure to clean them out thoroughly to keep the rollers moving smoothly. You should also clean the photo sensors that are located on either side of the door opening. These sensors send a beam across the opening and will stop the door from closing if there’s something in the way. It’s important to keep them clean, so sweep away any cobwebs, dust or dirt on and around the sensors. Do this carefully to avoid bumping them out of alignment while cleaning, and be sure to keep items away from them so they don’t get knocked out of alignment or blocked by anything. The weather-stripping that runs along the garage door bottom also needs to be cleaned regularly to ensure the rubber stays soft and doesn’t crack. You can use a damp cloth or sponge to wipe it down. Once you’re finished, run the opener a few times to inspect it and be sure it’s operating properly. The best way to look after your door is to know when it’s working properly, so you can be alert to any changes that need maintenance or a service call from our technicians at Garage Door Repair Little Elm, TX.